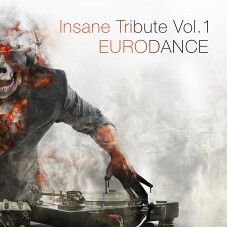 «Insane Tribute Vol.1 EURODANCE» is the first release of the future exclusive series by Insane Records. The Russian industrial label announced the creation of a special series of albums, each including cover songs of various genres or groups. As the first title says, the debut release is dedicated to the legendary electronic genre from the 90's. Eurodance had a huge impact on the Dark scene formation, for sure. That is why the label management decided to remind us of the origins and crossed these genres in the first release of «Insane Tribute» series. The CD includes 12 hits from the 90's by such top Eurodance artists as SNAP!, 2 BROTHERS ON THE 4TH FLOOR, HADDAWAY, JAM & SPOON and others, performed a new way by the talented Dark Electro projects: C-LEKKTOR, CHAMAELEON, PSYBORG CORP., ARIAN 1, PARASITE OF GOD, LARVA and others. 12 absolute hits from the past are reissued in modern dark vision, what could be better for a music lover of these two genres? So, the bit, aggression and dance floors melodies of our youth are waiting for you on the «Insane Tribute Vol.1 EURODANCE». The compilation is a must-listen!